The best selling chimney liner on the market. This is the liner chimney sweeps across world use to reline chimneys. Why? Because its corrugated on the outside to provide maximum strength and flexibility. Smooth-Wall on the inside that improves drafting up to 20%. It cost more but its well worth the extra expense. Everything you need in one kit to reline your chimney. Our kits include Double Ply Liner section, 2 part removable tee, tee cap, top plate with a built-in storm collar, round cap, fasteners, Installation instructions and warranty card. Tested and approved to UL1777 zero clearance standards. 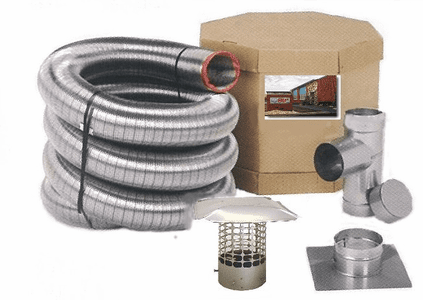 You won't find a lower price double ply chimney liner kit anywhere on the net guaranteed! And you do please let us know because we will beat that price guaranteed!